In today’s review, let’s put aside cryptocurrency mining and take a closer look at real estate markets. One of the latest rivals on DavidNews.com monitor is a program called Real Estate Markets LTD. It has been online for 85 days in total. An oldie, right? However, it joined Sticky Listing on our monitor just recently - on March 15, 2018. Currently, the program has status “PAYING”. I have reinvested $360 in the program and will keep you updated about the payments status on DavidNews.com monitor. Real Estate Markets LTD offers us to earn from real estate in the most affluent cities in the world. Read on to find out more about the program and their offer. Real Estate Markets LTD offers four investment plans – “Rental Hotels” with 1% daily for 7 days, “Rental Vilas” 1.5% daily for 15 days, “Rental Commercial Real Estate” with 2% daily for 30 days and “Company’s Shareholder” with 2.5% for 50 days. Deposit is returned at the end of the investment term. Each plan has a different deposit restriction. Investment range for the first plan is $10 - $500, for the second $50 - $5000, the third $100 - &10000 and the fifth $10000 - $50000. Withdrawal requests are processed instantly, and the program accepts the following payment systems: Bitcoin, PerfectMoney, AdvCash, Payeer, and Payza. What else worth mentioning? Any deposit limits. The admin informed me that only one deposit is allowed per each investment plan. However, I couldn’t find this information on the website! Feel free to check out the website yourself! Real estate is certainly not among the top industries in the HYIP world. Therefore, I was really looking forward reading the legend. Unfortunately, the legend of Real Estate Markets LTD lacks clarity and the link between real estate business and a HYIP. Of course, well written and thrilling i “About Us” page is not the key to success and a long-lasting HYIP. What information the admin of Real Estate Markets LTD provided on the About us page? “The company has been operating on the real estate markets in London, Zurich, Paris, Beijing, Dubai, Miami, Shanghai, Hong Kong and New York for over 17 years, leasing hotels, apartments, villas, commercial real estate”. Do you find a potential in such HYIP? Find out more on the website! 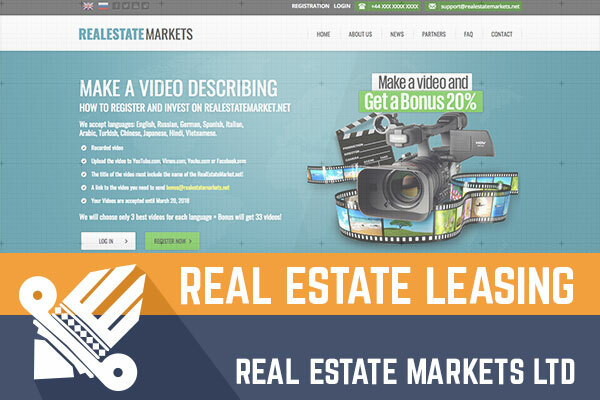 The website of Real Estate Markets LTD is pretty much a standard HYIP website. However, I find that there is plenty of space for improvements to make it friendlier for the user. For example, I tried to access the hyperlink “Legal Documents” on the Footer, but for a surprise, it just brings me back to the beginning of the page. Overall, the website contains a couple of generic images and promotional videos and I would say it lacks a great deal of important information for investors – investment calculator for example. The FAQ lacks answers to some of the most important questions regarding investment plans, deposits, and withdrawals etc. Of course, the most important aspect of any HYIP is making a deposit. However, this time the FAQ page covers only a few very general questions about the HYIP and why to become an investor in it. Therefore, in case you have any specific questions – contact the admin through the e-mail address given on the contact us page. However, feel free to visit the website if you are interested in additional income. At Real Estate Markets LTD you have two following options – affiliate program and a video competition. The affiliate program offers 2% on deposits up to $500, 3% on deposits $501-$750, 4% on deposits $751-$1000, 5% on deposits $1001 - $50000. The competition offers to get a 20% bonus if you make a video describing how to register and invest in Real Estate Markets LTD. It's not clear to me what exactly is the 20% - from your investment? Still, if you are interested but want to find out more, feel free to contact admins! If the admins don’t give us enough information, then we have to use the internet. Web.archive.org show that the domain is active since December 2010, unfortunately, the system hasn’t saved any proof what the realestatemarkets.net was back then. But If you want you can browse the site and try to find! Regarding the company registration details on the website, yes, the registration details and address matches. The company was incorporated on December 5, 2017, nature of business - Financial Leasing. What can we find on the forums about the program – the usual conversations about investment plans, deposits, withdrawal, admins. However, like I have mentioned here, people are also confused about the lack of information on the website. So, as always, I am going to take a closer look at a deposit where I could get the highest potential benefit with a $200 deposit. It’s a plan called “Rental commercial real estate” – 2% daily for 30 days. An investment of $200 in this plan would generate a daily net profit of $4. After 30 days – such plan should make $120, which is a 60% net profit. Sure, it can happen only if the program stays in the game for so long and doesn’t turn into a scam. These calculations are just to give you a better understanding. More potential for attracting a larger amount of deposits has a plan called 1,5% daily for 15 days assuming the minimum deposit and the deposit term. Feel free to do your own calculations and pick any amount you like to find out about the potential profit! We are looking currently at the program with short-term and mid-term investment plans. I must admit this program is not presented brilliantly, but it is something different from seeing so many cryptocurrency inspired programs. Admin could have provided more information about the potential investor. Then again, for many of you information located on the home page might be enough to decide if it’s worth investing in this program or not. Moreover, we can do our own calculations. Currently, the program has status paying and its safe for investments. However, we don’t know what will happen with it tomorrow like with any other HYIP. Therefore, if you ever decide to make any investments, don’t invest more than you can afford to lose! Have you already made an investment in Real Estate Markets LTD offers and have any useful information to share with us? Please drop a message in the chat box to share your experience! Investment plans: 1% daily for 7 days, 1,5 daily for 15 days, 2% daily for 30 days, 2,5% daily for 50 days. Deposit returned at the end of the term. Join Real Estate Markets LTD Here!